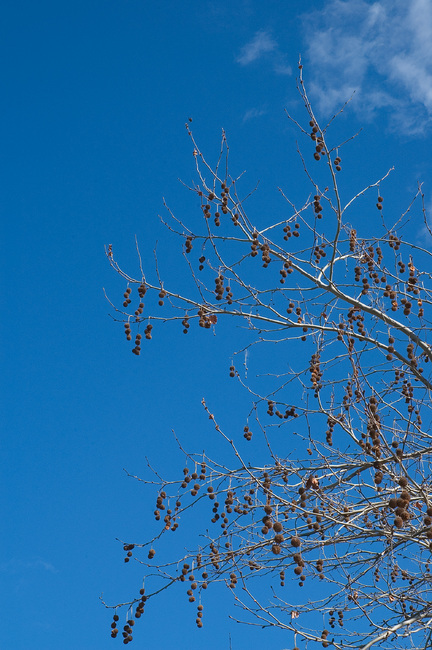 The seed-pods of these roadside Plane trees dangle in threads of two-or-more. When seen from a distance, with the naked eye, the effect is most disconcerting — as though one is seeing double. Update for Jamie: I've added a closeup of one of the seed-pods. They have an inner diameter (minus the spiky bits) of about an inch, and the dark holes are where the seeds live, prior to dispersal. Details: Nikon 18-70mm, 44mm, f/16, ISO 200. I like how the clouds match the tree somewhat. What do these look like up front? Like round pine cones? Those are fabulous little seed pods! Very interesting and unlike anything I've ever seen. Quite impressive. Thanks for posting the macro! Followed link from Jamie's site: Couple of nice shots here - I particularly like the blue sky. Did you use a polarizer? Gary: Thanks. No polarizer -- it's in my bag, but it doesn't come out that often. Actually I'd normally apply a slight 'S' curves adjustment, but doing so in this case pushed the sky to an unnatural colour, so I left it as-is. Jamie: Yes, thanks for the link -- I've already had several people clicking through, in the last hour. Well worth the extra macro post - wonderfully alien. The close up is a sweetgum/gumball tree, not a plane tree. Would love to know the exact type of plane tree it is. I have one of these trees in my front yard. nope, this is definitely a sweetgum tree. the seed pod is a little different from the London Plane Tree. you can see what I mean if you do a google images search of London Plane Tree. 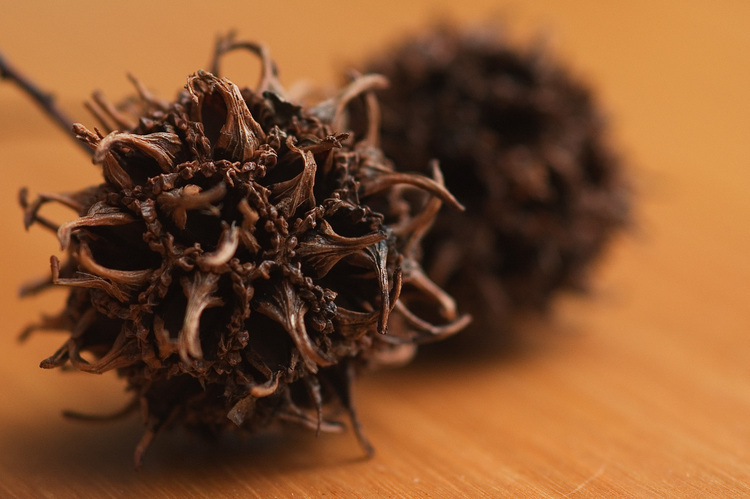 This sweetgum tree seed pod is spikier and WAY more interesting...especially as a close up shot!! Very nice job!